Jataka tales are ancient folklore which originated in India. Ellen C. Babbitt collected and retold these stories in two volumes, Jataka Tales (1912) and More Jataka Tales (1922). Babbitt's versions were based on translations created by Professor E. B. Cowell, professor of Sanskrit in the University of Cambridge, and his team between 1895 and 1907. Some of the Jataka tales may have been later ascribed to Aesop. Source: Babbitt, E.C. (Ed.). (1922). More Jataka Tales. New York, NY: D. Appleton-Century Company. 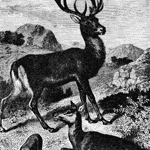 Two deer look after great herds of deer, and one doesn’t follow his father’s advice and loses many of the herd. How the little bowman became the king’s army chief. A man tries to fool animals in order to get food for supper, but the King of Wolves sees through his trick. An elephant and a dog become friends, but one day the dog is sold. The elephant refuses to eat or bathe without his pal, and soon the two are reunited for the rest of their days. A wolf refuses to believe that there are limits to what he can do. A monkey steals a string of beads, but the chief of the guards recovers them. A family of hawks has friends who save them. A monkey saves his friends from the king’s men, and the king is so impressed that he vows to keep the monkey safe for the rest of his life. A young lion makes friends with a wolf, against his father’s wishes. The friendship leads the lion to hunting the king’s ponies, which his father told him not to do, but the lion keeps on and ends up killed by the king’s archer. A wolf finds a clever way to get fish for supper. A king sees a monkey lose many peas in order to gain one more, and realizes he should not start a war with a remote, small country. A poor man’s good heart wins him power and riches over Prince Wicked. Young princes see a tree at different times of the year, and cannot agree on its appearance. How two traders get their plow and child back. Monkeys are unable to discern how much to water trees. The thoughtful fish saves his two less-thoughtful brothers, and they all return to a safer river. A wolf eats rats, but then the Chief of Rats finds out and bites his neck, killing him, so that the rest of the rats live in peace. A goat outwits two wolves. A woodpecker does a favor for a lion, who does not thank him. Later, the lion refuses to do a favor for the woodpecker, saying he already did him a favor by not eating him. Three friends help each other out. Babbitt, Ellen C.. More Jataka Tales. Lit2Go Edition. 1922. Web. <https://etc.usf.edu/lit2go/73/more-jataka-tales/>. April 20, 2019. Ellen C. Babbitt, More Jataka Tales, Li2Go edition, (1922), accessed April 20, 2019, https://etc.usf.edu/lit2go/73/more-jataka-tales/.